On the morning of the third day there was thunder and lightning, as well as a thick cloud on the mountain, and a blast of a trumpet so loud that all the people who were in the camp trembled. Moses brought the people out of the camp to meet God. They took their stand at the foot of the mountain. Now Mount Sinai was wrapped in smoke, because the Lord had descended upon it in fire; the smoke went up like the smoke of a kiln, while the whole mountain shook violently. As the blast of the trumpet grew louder and louder, Moses would speak and God would answer him in thunder. It is now the first day of the seventh week since the Israelites fled Egypt. Seven is one of the mystical numbers of the Hebrew scripture. It is the number of divine fulfillment. On this day, the Israelites are to meet God. They hear the voice of God in the fearsome thunder, lightning, and smoking mountain. The people are terrified. Perhaps God takes pity on the Israelites. God does not meet them physically. God meets them in God’s words, yhe Ten Commandments. 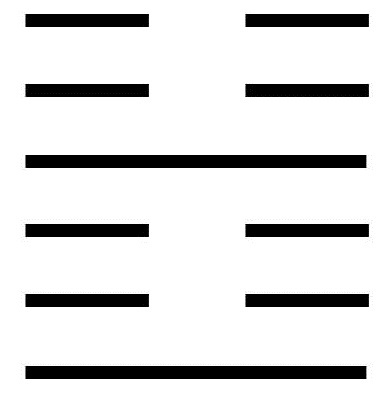 This hexagram consists of a doubled Word trigram. The image of the Word is Thunder. Thunder is shown as the strong lower line breaking through the two upper weak lines. In this hexagram, Thunder is doubled, giving it that much more power. When the strong breaks through the weak, the weak can never be the same. Shock, fear, and even nervous laughter are the immediate results, but long-term changes will also set in as the weak readjusts itself to the awesome presence of the strong. To expect a great manifestation of God. To understand that this manifestation will cause shock and fear. To be reassured that the shock will be followed by rejoicing. To look within for the Wisdom to guide one in addressing the terror of the Thunder. To recognize the thunder for what it is, a visible manifestation of a great change. To welcome the Thunder with calmness and acceptance. To continue honoring the religious traditions. A moving line in the bottom position portrays the shocked one as one who is at a disadvantage relative to others. It may seem that others are ridiculing the shocked one. But this will soon be over. Eventually relief comes, and the initial terror gives way to a positive outcome. A moving line in the second position describes a situation in which the shocked one is in danger and has suffered great loss. This is not the time to resist shock. Now is the time to retreat to where one can be safe. One must simply endure one’s losses, knowing that they will eventually be repaid. A moving line in the third position describes a particular kind of shock: the shock of fate. It seems that fate has dealt a cruel blow, and it is easy to give way to despair. God does not promise us a life without hardship, and now it seems hardship has overwhelmed all hope. However, God also promises that any hardship can be turned into a wonderful thing, even a miracle. It is a matter of following Wisdom’s way, which will show the path to transformation. A moving line in the fourth position describes a situation in which movement seems impossible. All seems caught in a quagmire. There is no energy for moving either forward or backward. A moving line in the fifth position describes not a single shock, but multiple shocks, with little time for recovery in between. But one can withstand the repeated buffeting of the waves if one can just remain centered and grounded. A moving line in the top position describes a situation when the shock seems at its height. At such a time, it is difficult to remain centered and grounded. It is hard to hear Wisdom’s counsel. This is a time to stay focused and wait for clarity to be restored, a time to withdraw from the tumult that is all around and to look inside oneself. Others will be caught up in the strife and express their unhappiness at the withdrawal. This is their problem. One can only control one’s own responses.